Arbor Hill is a family owned cabin in the heart of Blue Ridge. This cabin has many modern amenities including USB charging ports, free Wi-Fi, a Keurig coffee machine and smart TVs throughout the cabin. Looking for great cell service, we have verified AT&T, Verizon, Sprint and T-Mobile all work great! New*** Step down to our brand new fire pit and relax while taking in the long range mountain views! We've also paid close attention to detail and have included the creature comforts you'd expect from a luxury cabin rental. You'll find luxury linens, a supple leather couch, hammock swings on the back deck to enjoy the views, and a master bedroom with a private deck and a 5 seat hot tub with amazing blue tooth speakers to enjoy. The roads to the cabin are all well paved. The location of Arbor Hill is among the best in the region. Just 2 miles from the world recognized restaurants and shops in downtown, a few miles from everyone's favorite apple picking spot and farm Mercier's Orchard, 5 miles from Blue Ridge Lake Marina, and minutes from the Appalachian Trail. We look forward to sharing our mountain home with you and your family. We hope you will find Blue Ridge to be the perfect get away and come back year after year! Arbor Hill is a family owned cabin. We are northern transplants from Boston now living in the Atlanta area. We fell in love with Blue Ridge due to its similarities to North Conway, NH, one of our favorite vacation spots. Arbor Hill is convenient to shopping and restaurants, but feels like its in the mountains on top of Staurolite Mountain. Our guests will enjoy the many personal touches we have included in this modern cabin including a 5 seat hot tub, hammock swings, rocking chairs, comfortable outdoor seating, a large lounging leather couch. We have also included many family fun activities that will take you back to your childhood. We have an air hockey table, many board games (Battleship, Clue, Monopoly, Connect Four, Sorry) and for our old school enthusiasts we have provided Intellivision to relive the moments of video game past! Don't miss our brand new fire pit for all your fall and winter evenings outside! 3 Bathrooms including handicap accessible roll in shower on main floor. Cabin is located 2 miles from historic downtown Blue Ridge. Long range Mountain Views of the Blue Ridge Mountains. Table with 4 chairs, adjacent bar seats 4. 5 smart TVs ready for you to hook up your Netflix, Hulu or Amazon subscription. Cabin has door ramps and wheelchair accessible shower on the main floor. The cabin is beautiful and very clean. Each of the three bedrooms is on a different floor, so it allowed for everyone to have privacy. The bottom level has a little hang out/game room area along with a mini-kitchen. I would definitely rent again! Fabulous house and location. Well equipped, nicely decorated and comfortable linens. House was well spaced, with plenty of room and decks to enjoy the beautiful views. Very private area, a house is next door but it is still very private. Although very private and quiet, the house is also very convenient to shopping and restaurants. Beautiful accommodations with plenty of activities close by to entertain everyone. 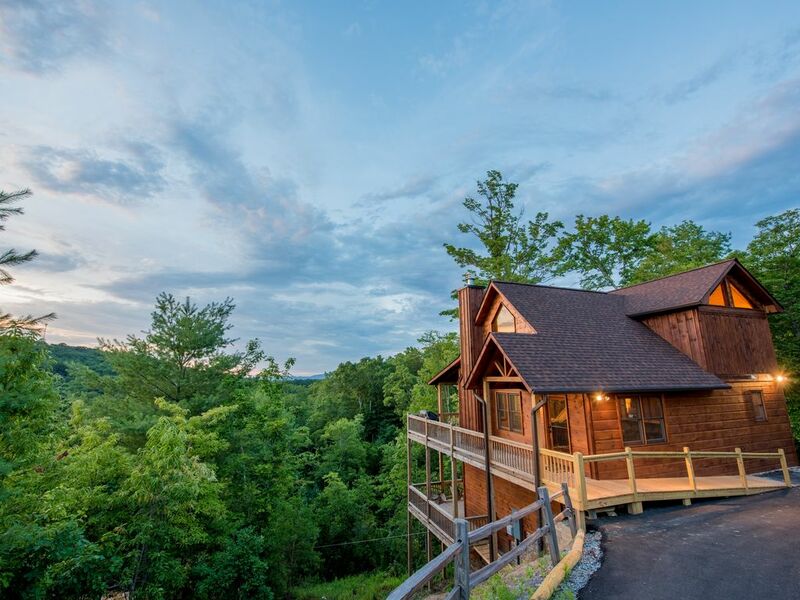 Absolutely perfect cabin in an absolutely perfect location! We thoroughly enjoyed our vacation and the cabin was a huge part of it. Centrally located, we were able to enjoy activities during the day and all the cabin had to offer in the evenings. The cabin is beautifully decorated and sparkling clean. Can't wait to come back and visit again! Thank you for your kind words!! We have the best cleaning crew in town! We look forward to seeing you again! Property was clean and close to the main city. View from property was great. Family loved the view and convenience to the cities attractions. Looking forward to the next visit. Thank you!! We look forward to having you as our guests again in the future! We loved every moment here. We had two families- 4 adults and 4 kids- and it was the perfect size. Homey without being crowded, enough room to lounge without feel lost. The area around it is incredibly cute and super friendly. We will ABSOLUTELY be back. Thanks Al! It was a pleasure to have your family and friends. Look forward to hearing from you again. Do you love going to the mountains, but you dread long car rides? Love to visit remote locations but also want great dining and fun activities near by? Arbor Hill is located 1.5 hrs from Atlanta, and only 1 hr from Chattanooga. It offers the serenity of a mountain escape with activities, dining and shopping just a couple of miles away!